The Flowers in the City campaign is perhaps the most visible demonstration of the Company’s charitable activities within the City of London. A street scene enhanced by colourful planting does much to contribute to the City’s international reputation as an enjoyable place to work. Firms which participate also comment on the uplifting impact an attractive workplace has on their staff. Flowers in the City still blooming: Assistant Helen Knight explains how our bi-annual flower campaign works and how it continues to make a difference in the City of London. The original idea was sown by the Company's Court in 1948, when London was still pockmarked with many blitzed and forlorn sites. Something was needed to brighten the City and after discussions with the London Gardens Society, a Competition for the Best Window Box or Balcony Display was launched in 1949. During the 1950s, the award scheme went from strength to strength. For the Festival of Britain in 1951, the Lord Mayor wrote a letter to support an appeal by the Master. 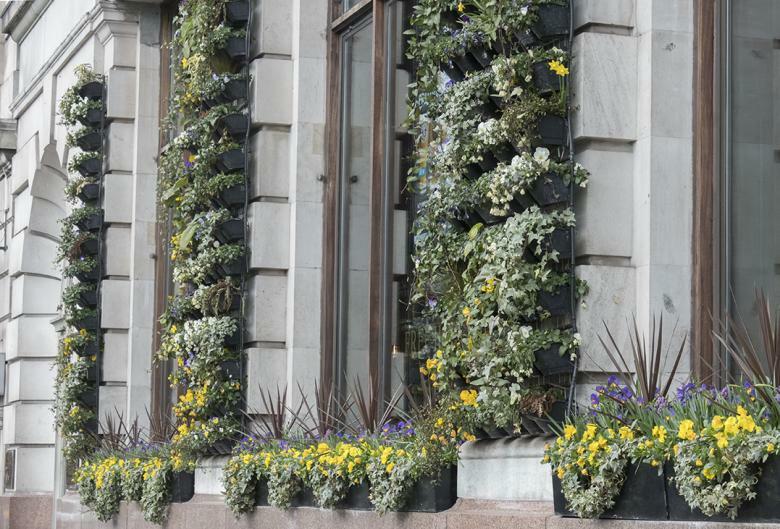 This was sent to hundreds of City firms, asking them to install window boxes. The call received an enthusiastic response, with nearly 2,000 window boxes lining the Festival opening route to St Paul’s Cathedral. For HM The Queen’s Coronation in 1953, many City firms again answered the call and window boxes became the fashion. During the 1960s, the award scheme was reviewed and re-named Window Box Awards. The emphasis shifted away from horticultural excellence towards the “decorative contribution to the beauty and gaiety of the City”. An association with the Metropolitan Public Gardens Association was formed and the strapline Flowers in the City was adopted. The City Corporation also gave its support. In 1985, the scheme reverted to being run solely by the Company with the support of the Lord Mayor and the Corporation of the City of London. Many new trophies have been added over the years. These have included an Atrium trophy in the 1980s, the Best Floral Street in the City in 1992, an Indoor Display Award in 2003 and a Livery Hall Trophy in 2008. The newest award is the Skyline Trophy to recognize the trend in roof gardens and green walls. Following a major review in 1997, it was decided to divide the awards into Summer and Winter Campaigns. The judges, all members of The Worshipful Company of Gardeners, visit their areas at least twice in each period and provide recommendations for trophies and plaques. Final judging for those put forward for trophies is conducted by the Master, Chairman, Secretary and the Head of Judges. Plaques are given to reward and encourage effort. They are produced in different colours for each season and are displayed on window boxes and buildings throughout the City. The Summer Campaign has three overall categories. The first is for displays of window boxes, hanging baskets, tubs, troughs and pots. The second is for garden displays and the third is a number of general awards, including the Master’s Special Award, given at the Master’s discretion. In total there are 15 trophies awarded. The awards ceremony takes place in the Mansion House and is attended by the prizewinners, judges and all the members of the Flowers in the City committee. The Winter Campaign is specifically aimed at brightening the City in the dull dark days of midwinter. There are four trophies awarded for the best displays in the City and one for the best of the best. The awards ceremony is held at Cutlers’ Hall.